Olga Rothschild is the Executive Director of Rothschild Mental Health Counseling. 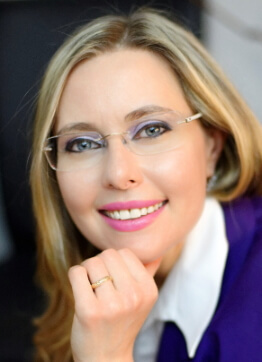 Olga utilizes an eclectic therapeutical approach including Psychodynamic, Cognitive Behavioral, Gestalt, Motivational Interviewing, Family Dynamic Techniques and other approaches. She is a certified EMDR Level 1 practitioner. Her focus is on the client, their issues and concerns as they're gently guided toward recovery and healing. She works with clients on their most immediate issues of concern at the beginning of the therapeutic process, and then focuses on identifying client's long term goals to help them achieve their goals, and pursue their dreams. She believes that being able to reach one's goals is one of the fundamental ingredients of success, and can help clients identify, and move toward their goals (whether it may be to decrease their suffering, depression, anxiety, improve relationships, pursue vocational goals, or other goals). Olga is a fluent bi-lingual Russian speaker. Valerie is a non-judgmental, understanding, and easy going therapist who provides a safe space to express your thoughts and feelings. She provides support and insight that will help you learn about yourself and how to effectively solve your relationship and behavioral problems. Depression, anxiety, loneliness, feeling stuck and unable to move forward in life can be relieved with solution-focused therapy. Understanding how, among other things, your childhood experiences may produce self-defeating behaviors and low self-esteem can help you make the positive changes that you want in your life. You may also have more specific issues such as: gender identity, OCD and relationship issues, etc. Together with the client she explores any obstacles that might be holding them back from the happiness and love that they deserve. Valerie enjoys working with adults and couples. Michelle is a culturally competent psychodynamic psychotherapist at Rothschild Counseling. She utilizes various cognitive-behavioral techniques and solution-focused strategies. Having experience working with age groups ranging from adolescents to adults, she can support individuals struggling with various transitions surrounding identity, relationships, and career. She works with individuals struggling with depression, anxiety, trauma, grief and bereavement. In utilizing evidence based practices that address many issues, she works with the client to create an in-depth comprehensive treatment. Annabel is a compassionate, caring and experienced therapist who believes that psychotherapy is a wonderfull tool for change. She's analytical and posseses great knowledge of Cognitive Behavioral Therapy and Psychodynamic techniques. She's culturally sensitive and speaks fluent Russian, Kyrgyz and Uzbek. Her personality is warm and she is diligent in helping people improve their lives. She is sensitive to acculturation issues and provides psychological support to recent immigrants. Victoria will provide you with support and compassion as you begin your journey of transformation. She will help you learn new and effective ways to deal with current and past challenges in your life. Her method to helping you is based on her experience working with children, adolescents, and adults in mental health facilities, clinics, schools, and private practice settings. Victoria’s challenging and direct, yet empathetic and considerate approach will allow you to reach your highest potential. Victoria’s therapeutic style is collaborative, flexible, and integrative. As your therapist, she will adapt her approach to meet your needs. She uses the training she received in cognitive behavioral therapy, motivational interviewing, psychodynamic psychotherapy, and client-centered therapy to help you achieve your goals. Yaron believes the more you learn about yourself, the better you can live a full and happy life. Yaron is a culturally competent psychotherapist who provides space to express what the person is dealing with, judgment aside. He comes from a psychodynamic approach to therapy and believes that the way to understand a person’s problem starts with a better understanding of his/her past experiences. He also uses cognitive behavioral therapy, and incorporates relaxation skills and guided imagery techniques in his sessions. Yaron sees great importance in the words a person uses in session, and builds most of his work around revealing the unconscious content and how it is relevant to the person’s everyday life. Yaron has extensive experience working with individuals from the LGBT community. He also works with individuals, both teenagers and adults, who deal with depression, anxiety, HIV, trauma, relationship issues, addiction and immigration. As an immigrant he understands the complexity of moving to another place and dealing with the cultural differences that sometimes can be very traumatic. Yaron is fluent in English and Hebrew. Doug is clinical supervisor and therapist who is a licensed clinical social worker in New York as well as other states. Doug has over 20 years experience working with a variety of populations, addressing a multitude of emotional and mental health issues. He is active in the National Association of Social Workers (NASW), serving on the Board of Directors. Doug is a Certified Substance Abuse Therapist and trainer for the Association of Addiction Medicine (ASAM). Doug has worked with children, adolescents, families and groups in a number of therapeutic settings. Doug's focus is always first and foremost on the strengths based perspective, with the belief that all persons have the capacity to change and improve their lives. Doug utilizes an eclectic approach to therapy including Cognitive Behavioral Therapy, Solution Focused therapy and Motivational Interviewing, as well as always encouraging mindfulness. Doug believes that the most important part of his job as a therapist is to be present with the client at all times and to constantly strive to grow his empathic skills, in an effort to help as many people as possible. Doug strongly believes it is important for each client to leave his or her therapy sessions with a sense of validation and hope. Karen is a compassionate, genuine, and culturally competent therapist that is passionate about helping individuals develop a healthy and nurturing relationship with themselves, as well as those in their lives. She is experienced in working with children, adolescents, adults, couples, and families. Karen utilizes various treatment modalities and styles best suited for each individual client which includes: Cognitive Behavioral Therapy, Solution-focused Therapy, Mindfulness, and Motivational Interviewing to name a few. She has also found utilizing creative arts strategies such as Art and Music therapies to be extremely helpful when working with children and adolescents. Karen has helped clients work through challenges pertaining to relationships, depression, anxiety, self-esteem/self-worth, grief/loss, domestic violence, trauma, and addiction. It is Karen's belief that through the therapeutic relationship, clients can develop self-awareness and coping strategies to improve their overall wellness. Danielle is a warm and nonjudgmental therapist who creates a safe setting so that you feel comfortable discussing your thoughts and feelings. She utilizes a psychodynamic approach believing that our past plays an important role in who we become. Danielle has experience working with children, teens, adults and families and has extensive experience working with people with a history of trauma. She uses a variety of modalities, such as cognitive-behavioral therapy, solution-focused therapy, play therapy, and art therapy to help clients attain their goals and become the best versions of themselves. Megan is an empathetic, caring and a non-judgmental therapist. She believes in offering a space where you feel safe, heard and seen. She utilizes an eclectic approach incorporating psychodynamic, attachment based, cognitive behavioral and family systems to name a few. She holds extensive experience working within the LGBTQ population, adolescents and young adults. Megan works with individuals and couples on relationship problems, life transitions, identity, self-esteem/self-worth, anxiety and depression. Steven is an empathetic and supportive therapist that is passionate about helping people to feel their absolute best. His style of therapy is one that is collaborative, conversational, and adaptive. Steven's treatment modalities include cognitive-behavioral therapy, solution-focused therapy, and mindfulness to help clients develop insight so that they can feel empowered to solve problems. He has experience working with adolescents, adults, and couples in diverse settings. Steven helps those who are dealing with behavioral health issues, relationship issues, and difficult life-transitions to develop positive coping strategies. He believes that the journey to mental wellness begins by establishing a healthy therapeutic relationship in an environment that is safe and non-judgmental. Katherine is an open-minded and caring clinician, who has experience working with adults, teens, children, families, and couples. She believes in offering unconditional respect and warmth, to help build a positive therapeutic relationship where healing and growth can occur. Katherine works with multiple modalities, including cognitive behavioral therapy, motivational interviewing, narrative therapy, play therapy, Gottman Method Couples Therapy, and psychodynamic psychotherapy. However, she is always open to input from clients on where they want to see their therapy go. Malvina is the office manager for Rothschild Counseling. She is responsible for keeping the day to day operations running smoothly. Malvina has many years of experience in the business world working for major companies. She is a fluent English and Russian speaker. Alexsandra is an Administrative Manager at Rothschild Counseling. She is responsible for front desk operations and serves as a liason between patients and therapists to assure quality care. Alexsandra is fluent in English and Russian. Alina is a Front Desk Specialist at Rothschild Counseling. She is responsible for coordinating top quality care and acts as a liason between clients and therapists. She is studying for a degree in psychology. Krystsina is a Front Desk Specialist at Rothschild Counseling. She is responsible for answering phones, greeting clients and administrative tasks.